The proposed Cairns Global Tourism Hub will sit waterfront, near the city’s cruise terminal. Three hotel, casino and entertainment firms have been shortlisted by the Queensland Government to prepare detailed proposals for an AUD$1 billion ‘Global Tourism Hub’ to be built in Cairns. 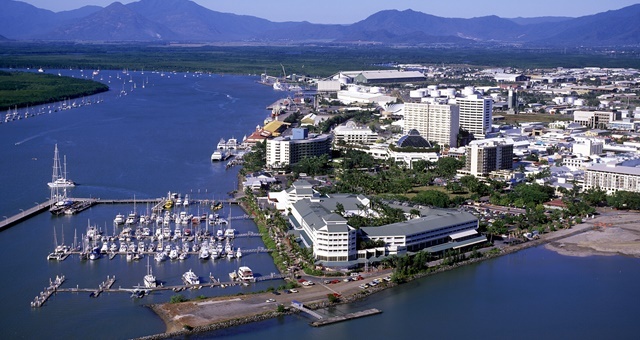 The Star Entertainment Group, Reef Casino Joint Venture and Hard Rock International will all submit individual plans for the waterfront site, located near the Cairns cruise terminal. The development is expected to offer plans for multiple five-star hotels, a casino, entertainment and recreation facilities, conference spaces, restaurants and retail. Following the withdrawal in late-2017 of the Aquis proposal at Yorkey’s Knob, north of Cairns, the Palaszczuk Government opted to sweeten the pot for potential developers by offering a gaming license as part of the development. Last year, businesses of all sizes were invited to express interest in being involved, with these expressions to be presented to all shortlisted candidates. Queensland Tourism Minister, Kate Jones, said the interest from three world-class development and entertainment firms showed the opportunity was highly regarded and a vote of confidence in the region. “The three firms named today are companies with strong international and domestic reputations for delivering high-quality mixed-use, hotel and entertainment and gaming projects. “These companies recognise that with the reef, rainforests and world heritage areas on its doorstep, Cairns has huge potential as an international hub for tourists,” she added. An interactive tender process is now set to begin, with submissions from the three applicants due by July. A decision on a successful developer and its proposal is expected in late 2019 or early 2020.